After having breakfast at your hotel or private address in Hanoi Old Quarter, you will be picked you up around 08:00 AM with our private car (separately charged). It takes around 3 hours from Hanoi to Ha Long Bay. This is the place where sculpted limestone and islands rise from the azure waters, where you are able to contemplate picturesque areas like the Mat Quy and Am islets. Later at lunchtime, a delicious buffet will be served shortly on board. 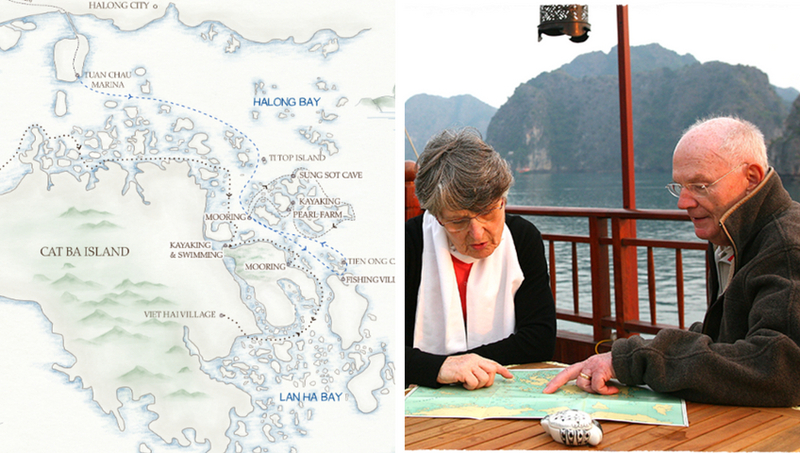 The boat then will cruise into Ha Long Bay and you’ll have an hour to enjoy this world heritage site. First of all you’ll have a chance to take a look at Tien Ong Cave, which’s about 2.000sqm, 4m above sea level, full of incredibly gorgeous stalactites and stalagmites. We strongly recommend that you do not warn high heels for this 20-min visit. 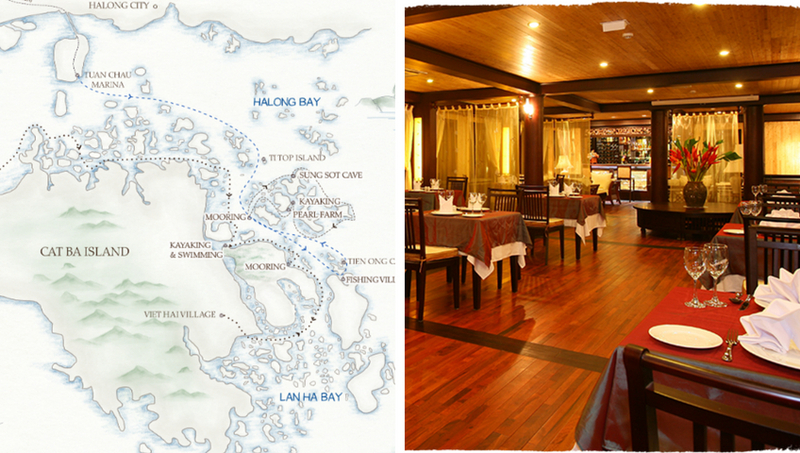 Our 4-person boat will then carry you to Cua Van Fishing Village, the biggest and oldest fishing village in Halong Bay. We promise that its floating houses and floating schools are simply irresistible. In the late afternoon, as returning to the boat you may attend our cooking class held by our professional chef. After that it’s your choice whether to spend the whole evening enjoying a massage or to grasp a drink onto the terrace drowning yourself in the beauty of the night. There’s a Tai Chi Chuan Class on the terrace deck starting at 7:00AM, suitable for early risers who wish to enjoy complimentary morning tea, coffee and pastries. Later on our boat will then bring you the natural white sandy beach with crystal clear water, where you can enjoy a stretch, a swim, or a climb to the hill for a last view over Halong Bay, before returning to the boat back to the city. During the voyage we’ll also pass picturesque areas like Tam Cung Cave, Bai Tho Mountain and Ti Top island. 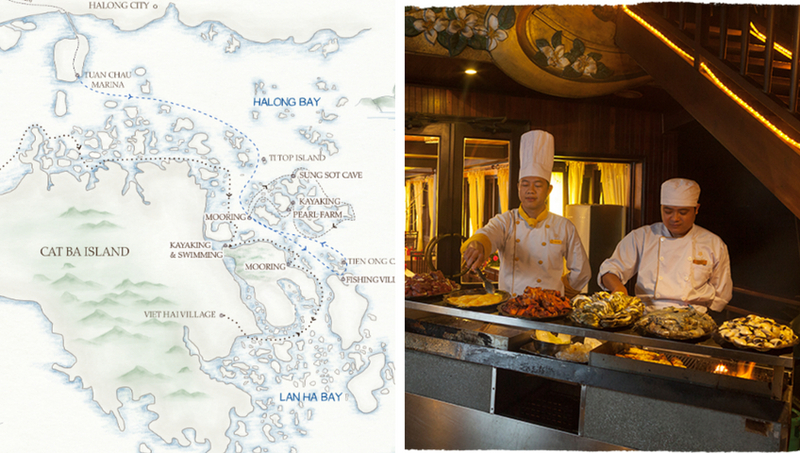 A buffet brunch will be served on board at approximately 11:00PM. You’ll be present at Hanoi around 3:00PM. Please notify us of any special dietary requirements or food allergies as soon as possible before your departure date. Non meat eaters are well catered for. Advanced registration will be required so please provide us your passport information (name, date of birth, passport number, visa validity) prior to departure.